The range of AXIOMET measuring devices available in the TME’s offer has been enriched with a new Video Pyrometer AX-7550. It allows a non-contact temperature measurement in the range from -50° to 1600°C. 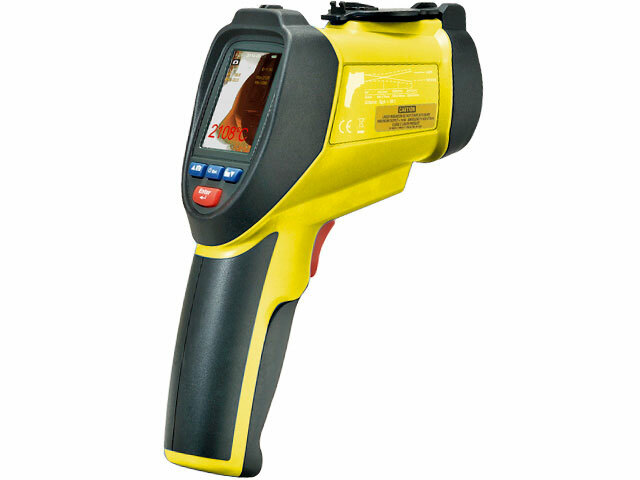 Unlike other pyrometers, AX-7550 is equipped with a digital camera with the resolution of 640x480 pixels. Thanks to this, in the video mode it is possible to record a film with the marker of a place in which the temperature was measured. Furthermore, on the screen there is an information concerning temperature: instantaneous, minimum, maximum, ambient, dew point and relative humidity. The measuring device can also operate as an instrument recording the temperature in time function. Properties such as: optical resolution of 50:1, possibility of emissive power adjustment, two-point laser indicator allows a wide use of the pyrometer for the measurement of various elements’ temperature from a far distance, or elements with small dimensions. The Pyrometer is equipped with a socket to connect an external K-type probe and a USB socket. The thread located in the handle allows mounting the meter on a tripod.